This is Amelia. Go on, say hello. Yes, I just took a photo of my computer containing the blog that I was writing at the time, which you are currently reading. It’s like fully meta time travel or something. When she first came into my possession in January 2009, she was shiny, fast and exciting. I had left my heavy, clunky, noisy Toshiba laptop behind, and I was ready to move into my second year of university (and the future) with a brand new Macbook in dashing aluminium. She was beautiful. These days, she’s a bit battered and bruised. Her finish has been scratched and buffed into a scummy kind of dullness, the triple j sticker I slapped on her lid as a kind of ‘up yours’ to the establishment that was my Commercial Radio degree has faded so much that you would never recognise that it once said something, and there is a special kind of grime between her keys that can only come from years of love (also known as frantic typing, spilling of various foods and liquids, and general grossness). I have started novels, written countless blog posts, bashed out some (very basic) HTML code, and composed scripts, essays and reports on her screen. I have sat down in front of her tiny in-built webcam to chat via Skype, make videos and take endless selfies. I have used her to record podcasts, and occasional, poorly thought out attempts at making music. She knows more of my secrets than anyone or anything else. She is easily the most beloved gadget in my arsenal of modern technologies. How she has managed to put up with the abuse I have put her through is a total mystery to me. The only time she faltered to any major degree happened after I spilled half a bottle of nail polish remover over her keyboard, resulting in her spitting out all sorts of foreign characters whenever I tried to type. When I took her to get fixed, the technician said it was a minor problem, not due to the spill but because of a spectacular bump that had left an indent in the top right corner of her lid. He fixed it in less than 24 hours and didn’t charge me for the service. Even he commented on her incredible toughness. She is the most obvious connection between my university days, my employment in both Bathurst and Canberra, and that awful ‘between jobs’ period in which I currently dwell. Even though I have treated her quite roughly, I really do love her, and I struggle to comprehend living without her. Hence it pains me to think our relationship might soon be coming to an end. Today, I sat down and I recorded a piece of audio that I intended to use as part of this week’s blog. I exported it as an mp3 from Garageband, then saved the project so I could close the program while I worked on the written part of the entry. I finished the words, copied and pasted them into Blogger, then opened Soundcloud to upload the audio. From previous experience, I knew that sometimes Garageband gets confused and forgets to spit out the exported file I have asked it to, so I shrugged my shoulders and went back to the project file to re-make the mp3 file. But something was wrong when I opened the file: it was completely corrupted. The audio I had spent a good half-hour recording was completely gone, like Amelia had completely forgotten to commit it to disk. I was confused, sad and angry all at once. All that work couldn’t have just disappeared! I looked through the sub-folders, searching desperately for what I’d lost, but it wasn’t anywhere. It had just gone. Amelia had let me down. I can’t pretend that I was overly surprised. Over the last year or so, Amelia has been increasingly moody, refusing to charge and running with decreasing speed. It is to be expected of machines – they wear out and tire, especially in this current environment of ‘planned obsolescence’. I checked Amelia’s stats in System Preferences to see what could be the matter, and it seems her battery is dying and will soon need replacing, but it’s more than that. My regular clean outs of her hard drive aren’t making a difference any more, and she struggles with processes that she used to wizz through with the mechanical equivalent of enthusiasm. She’s a fading star. It seems stupid, but I don’t know if I’ll be able to deal with it when she finally decides that it’s time for her to go to the big Apple store in the sky. She connects me to so many people, places and characters, both literally and metaphorically, that I struggle to see a future with a computer that isn’t her. 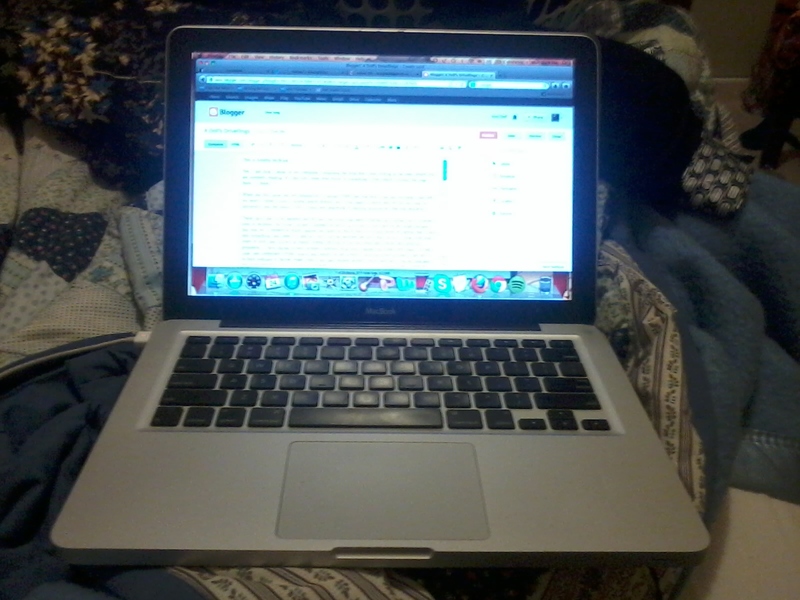 She’s my laptop, but she’s also my confidant, my co-worker and my friend. I don’t want her to die. Then again, maybe it’s all just silliness. Perhaps I should just toughen up and remember that she’s just a machine, built for a task that has been done well. Maybe it’s time to back it all up and get up to speed with a shiny new model. It’s what Steve Jobs would have wanted, after all. But it is more than that. There’s a connection between me and the machine, even if it’s one way. I will miss Amelia when she goes, and therefore I can’t help putting it off as long as I can. I’m not ready to upgrade just yet. How could I do that in three letters though? “Yep.” Does that work?